Public policy researcher and analyst with a specialty in cartography. I do data analysis and visualization for news media, non profits, and private firms. On a recent trip to Lowe's, I noticed this sign on one of the gas grills for sale outside. 1) Juicier compared to what? I hope juicier than raw food. 2) How do you measure juicy? What's the unit? 3) What about variation from user behavior? Surely anyone could cook the "juice" out of food if they grill it on high for 30 minutes. 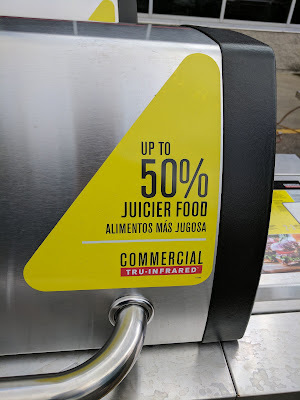 4) And "up to" suggests less juiciness less than 50% higher is not only possible, but is the maximum. So what's the distribution? Any other methodological problems with this claim? just love the questions you put up. When advertising companies put up slogans without actually explaining them in detail and customers being naiive just purchase withoyut getting proper knowledge.